UnidosUS, a leading national Latino civil rights and advocacy organization, is planning a bilingual Latino presidential forum in Nevada during Hispanic Heritage Month in October, according to a proposal obtained by The Nevada Independent. The forum would see the leading Democratic candidates addressing issues of importance to the Latino community, including health care, the economy, education, immigration and Puerto Rico and Latin American affairs, such as unrest in Venezuela. While the Democratic National Committee (DNC) does not interfere with outside forums, they cannot be structured like debates, with candidates addressing each other on a stage. Voto Latino and Mi Familia Vota, two other influential national Latino advocacy groups, would be likely partners for the forum expected during the second week of October. UnidosUS has also had preliminary conversations with Univision — the fifth most watched broadcast network in primetime last month regardless of language — about airing the event. Although the campaigns noted it was difficult for them to fully commit to attending the forum because they haven’t received official invitations yet, many of them expressed strong interest in attending a presidential forum aimed at Latinos in the first state on the calendar with a large population of minority voters. 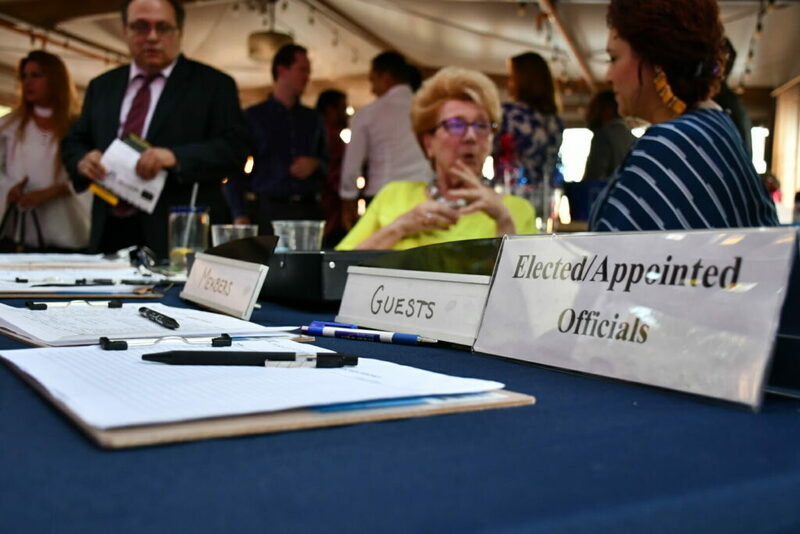 Organizers man a sign-in table at a Hispanics in Politics meeting on June 6, 2018 in Las Vegas. Photo by Alexander Zapata. Warren’s camp said it can make a decision once they receive an official invite and Booker’s camp said they would be in as long as the format is compliant with DNC rules. While Sen. Kamala Harris’s campaign said they would consider attending a diverse range of forums once invited, a senior aide said Harris would be well-positioned to appeal to Latinos because of the way she clashed with former Homeland Security Chief John Kelly. She voted against the wall, and was an “outspoken and fierce ally” for the Latino community and DREAMers as California’s senator. Beto O’Rourke, the bilingual former Texas congressman, who emerged as a serious contender after raising $6.1 million during his first 24 hours as a candidate and campaigned in Las Vegas over the weekend, welcomes the opportunity to speak at forums like this, said spokesman Rob Friedlander. Veterans of past Nevada campaigns believe this level of enthusiasm to address, engage, and compete for Latino voters is a good thing, but they caution candidates are going to need to bring a thoughtful approach that is heavy on specifics. “It’s great to have a forum and have everyone agree that deportations are bad and Trump is horrible but in the meantime there are a lot of issues in our community and it’s important to hear that someone has a plan to address them,” said Jorge Silva, deputy chief of staff to Sen. Jacky Rosen and a former senior advisor to Harry Reid. Jorge Neri, one of the chief architects (along with Emmy Ruiz, who is now advising Harris) of Hillary Clinton’s 2016 Nevada caucus win, despite a furious Sanders challenge in the state, said major Nevada events represent the first chance to have conversations around Latino voters and Spanish-language messaging, which if successful, can be scaled up and amplified nationally. A candidate forum like this, if it aired on Univision, would again spotlight the importance of Spanish-language networks in reaching Hispanics, and come on the heels of the February announcement that Telemundo would be a co-host of the first presidential debate, along with NBC News and MSNBC. Taking Latino media seriously early on is critical, argued Indivisible’s national political director Maria Urbina, also a former Reid aide, but beyond signaling that candidates want to have a conversation, the questions are what will they say once Latinos are listening and how do they see Latinos as part of a winning coalition? A key part of that answer, Urbina said, would be elevating immigrants to the center of the party’s priorities. “Democratic candidates need to treat justice for immigrants in the same way they treat Medicare for All and the Green New Deal,” she said. Nevada state Sen. Yvanna Cancela echoed Urbina’s comments, arguing that the Trump administration had been aggressive and unrelenting in enacting their anti-immigrant agenda, and challenged Democratic candidates to be prepared to offer the antidote to his presidency. “It would be important for candidates to talk about how, if elected, they would offer a broad, sweeping vision for immigrant inclusion and integration, but also what they would do to rollback changes we don’t read about in newspapers,” she said. “Issues with immigration enforcement, cutting back staffing at U.S. Citizenship and Immigration Services (USCIS), and fixing the citizenship process to ensure there’s not a backlog in the system like there is today where it takes a year to naturalize.” She also favorably mentioned Gov. Steve Sisolak instituting an Office for New Americans, something she thinks could work at the federal level. Astrid Silva, a prominent DREAMer who has used her celebrity to help organize Castro, Harris, Warren, Booker and O’Rourke’s recent meetings with immigrant families from the Las Vegas community, said the majority of people’s issues are within 100 feet of their home like housing, paying their bills, access to medication, and getting their kids to school. Issues like housing, however, can be unexpectedly challenging for mixed status families, something she recently dealt with herself. With housing prices rising rapidly and local homeowners selling, Silva found herself dealing with an unfamiliar property management company and struggling to provide the various documentation she needed. A mixed-status family may include someone who lacks ID, a Social Security number or credit. Jess Morales Rocketto, political director for the National Domestic Workers Alliance (NDWA), said the proposed forum topics are good but what is missing is a real focus on Latinas and not just because a majority of immigrants are women, Latinas control household purchasing power, or are dealing with the kids at school. UnidosUS leadership said it was a little premature to get into the details of the presidential forum in Nevada because they’re still sorting out logistics, “but we hope that sorting will be done relatively quickly,” said Albert Jacquez, senior director of legislative and political affairs. Mariela Hernandez, a Latino advocate working with the Nevada Democratic Party told The Nevada Independent she was made aware of the proposed forum, and while a spokesperson for the party said they haven’t had any discussions with UnidosUS about the forum, they’re waiting to hear more. Voto Latino, which has discussed partnering with UnidosUS, is said to be dealing with what sources described as a “complicated” issue: That their co-founder Rosario Dawson is dating a presidential candidate, Booker. Four sources, including former staff and people who have spoken to current staff, said it is an issue for the organization. “She’s not campaigning for him, so it’s not an issue now,” countered one current staffer. “But I could see how it might become an issue.” In 2016, Dawson was a campaign surrogate for Sanders. 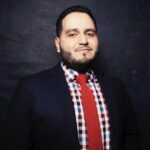 Mi Familia Vota declined to discuss forum details but spoke broadly about why hosting a forum like this in Nevada makes perfect sense citing demographics, growing Latino voting power and the benefits both to Nevadans and campaigns, which are able to test what messages resonate with voters. The forum would recall past Latino-focused forums or debates and introduce a wrinkle. The forum proposal calls for a bilingual debate where questions could be asked in English or Spanish and candidates could answer in English or Spanish, which may be helpful to O’Rourke and Castro, who can speak Spanish. During a similar Univision forum in the fall of 2007 at the University of Miami, Bill Richardson and Chris Dodd, who both speak Spanish, were against the debate being held in English and simultaneously translated into Spanish. But their bilingual skills were seen as an advantage by some of the other participants, which included Hillary Clinton, Barack Obama, and John Edwards. In 2012, Univision held townhall interviews with Obama and Mitt Romney, and in 2016 the network held a Democratic primary debate in Miami, while NBC and Telemundo partnered for a Nevada townhall with Clinton and Sanders hosted by Chuck Todd and Jose Diaz-Balart. For Silva, who feels she’s living in an alternate universe with presidential campaigns working the phones to meet with her, what matters is that candidates speak to the Latino and immigrant community when they come to Nevada.